Thanks to the exhaustion of two weeks of constant travel combined with free movie channels and perhaps one too many cups of DayQuil, I sat still long enough this morning to enjoy my second viewing of We Bought a Zoo from the brilliant Cameron Crowe. I always see more the second time I watch a movie like this, and I wanted to talk about the powerful symbolism he utilizes in the film. Somehow, I feel like We Bought a Zoo hasn’t yet garnered its due as yet another Crowe classic. It’s no secret that Crowe’s movies, from Jerry Maguire to Almost Famous to my personal favorite, Vanilla Sky, always feature real-to-life characters and emotional, heart-warming or heart-wrenching stories. But just as prevalent are the symbols that deserve exploration from a writing perspective. Crowe seems to realize this himself, and takes several moments of pointed dialog to remind his viewers his story is still about people, not just animals. More on that later. First, let’s talk symbols. WARNING: Starting below, SPOILERS abound. If you haven’t seen We Bought a Zoo yet, what are you waiting for? It’s Cameron Crowe, after all. Go see it now, then come back. I’ll wait. Those of you who have already seen the movie or don’t mind a little discussion of its themes and symbols before you do, please read on. 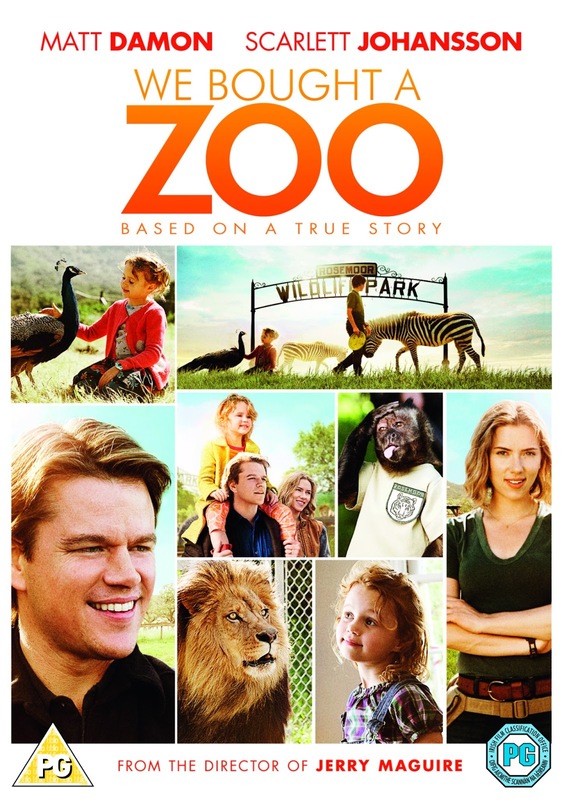 The story in We Bought a Zoo centers around the Mee family – widower father Benjamin (Matt Damon), teenage son Dylan and younger daughter Rosie. We learn Benjamin’s wife Katherine has passed away and the family, particularly Benjamin and Dylan, are struggling to deal with her loss. Father and son are in almost constant conflict with each other, neither seeming able to let go of their mother/wife and acknowledge they have to move on without her. Benjamin is particularly tough on Dylan, fighting a constant battle to keep his son on the right track in school and everywhere else in life. Benjamin decides a move for the family might do them all some good and, after searching for just a normal home with a big backyard, stumbles upon an old zoo in need of an owner and financier and decides to take his family on an adventure by buying it. There he meets Kelly Foster (Scarlett Johanssen), the long-time caretaker of the zoo and a person who spends all her time with animals rather than humans. It’s a zoo, so there are a lot of animals in the story, but two are given the most important roles / sub-plots: Buster the Bear and Spar the Tiger. These two animals are very important symbols in the story. Buster the Bear: In the middle of the movie, as Benjamin and the entire cast struggle to get the zoo ready for its planned summer opening, the huge grizzly bear escapes. Benjamin and the rest of the zoo staff must track him down. It’s Benjamin, armed with a tranquilizer gun, who locates him first. The bear slaps away the gun and Benjamin is left to stare him down alone and weaponless. The bear stamps his feet, releasing his frustration in a long, spittle-filled growl straight into Benjamin’s face, before the other zookeepers arrive and tranquilize the huge animal. Following this encounter, Benjamin gets a distant look, then announces he wants to enlarge the bear’s enclosure after they return him to the zoo. On the surface, this encounter may seem to be merely added conflict: another obstacle for Benjamin to overcome in his frantic effort to get the zoo open on time and avoid the negative publicity that a large, escaped animal would generate. But this subplot is much more than that. The physical, literal lashing out of the bear is a symbol for the way Benjamin’s son, Dylan, has been lashing out emotionally since his mother’s death. And when Benjamin realizes that Buster only escaped because, though they had thought they’d been giving him enough room, he actually needed more space, a larger enclosure, he also starts down the road of realizing he has to give his son more room if he’s going to survive the aftermath of his mother’s death. In the very next scene, Benjamin is seen drinking a beer while his son sneaks off with a girl his age, Lilly (Elle Fanning). Rather than stop him, he allows him to wander away. Spar the Tiger: One of the first animals Benjamin meets at the zoo is the tiger, Spar. Spar is injured and throughout the film it becomes evident he will need to be put down. The more experienced zookeepers realize this, but as owner it’s Benjamin who must make the final call. He is reluctant to authorize what’s necessary, constantly searching for hope that Spar will somehow get past his injuries and stay alive. Again, more than yet another source of conflict for the family, Spar is a clear symbol for Benjamin’s deceased wife Katherine. Just as he can’t let go of her, he refuses to follow Kelly’s advice and let Spar go either, even though the animal is clearly suffering. Even Dylan demands that Spar be given every chance to live, agreeing with his father that the tiger should not be put down. Thus it’s only natural that the final reconciliation between father and son occur in front of the dying Spar. As Benjamin and Dylan finally have the conversation they need to have, the gasping, prone tiger looks on, as if Katherine herself is watching them come to an understanding and finally decide to move on. After this conversation, Benjamin authorizes the zookeepers to put Spar down. In the very next scene, he is finally able to view his pictures of Katherine and release his emotions, crying on the kitchen floor in front of his computer. As he lets go of Spar, he also lets go of his wife. So if you haven’t seen the We Bought a Zoo, please do! And if you have, maybe this post allows you to watch it a second time in a new light. This entry was posted in Movies, Symbolism, Writing Advice. Bookmark the permalink. I’m afraid it’s been a bit since I’ve seen the movie! If I re-watch it soon, I’ll definitely keep your question in mind. Thanks for reading!